The versatile design of this indoor and outdoor camera lens makes it compatible with most smartphones and tablets, such as Iphone 4/4S, 5/5C/5S/SE, 6/6S/6 Plus/6S Plus, 7/7 Plus, and iPhone 8, iPad Air, Air 2, 3, 4, and Pro, Samsung Galaxy S4, S5, S6, S6 Edge, S7, S7 Edge, S8, Note 4 and 5, Motorola, Huawei, Nokia, and many others. CAPTURE IT ALL - Whether you're shooting large landscapes or taking a group selfie, ZWARTpro 0.45X Wide Angle Lens opens up the scene, allowing you to capture it all. That's right! With this camera lens kit, you can snap wide format selfies without using a selfie stick! SWITCH WITH EASE - Let's face it. Struggling to change back and forth between your smartphone lenses is no fun. 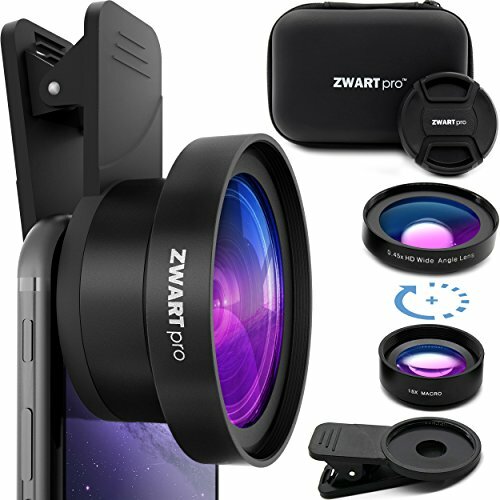 Maybe that's why the hassle-free mechanism of ZWARTpro Cell Phone Lenses makes this whole process a piece of cake! NO SCRATCHES - With ZWARTpro HD Camera Lens you can take crystal clear photos without worrying about scratches. Featuring a detachable clip with soft rubber padding, the Cellphone Lens will leave no scratches or marks on your smartphone or tablet. OUR GUARANTEE - We're so confident in the quality of our professional camera lens that we offer you a 30 days money-back guarantee and a 12-month phone camera lens replacement warranty (extendable to 24-month product replacement warranty). No hassles with us! If you have any questions about this product by ZWARTpro, contact us by completing and submitting the form below. If you are looking for a specif part number, please include it with your message.